TBILISI, DFWatch–The Georgian president says it was not right of the former justice minister Zurab Adeishvili to run away from the country and that he wouldn’t have done the same. 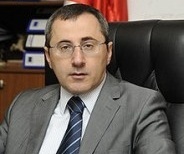 But Mikheil Saakashvili also said that Zurab Adeishvili had planned to leave Georgia after the election in any case. Adeishvili is seen as a leading ideologue during many years of Saakashvili’s government. He had great influence and made decisions in financial and legal issues in the country. When Saakashvili’s party was defeated in October’s election, the former minister secretly left the country and has never returned. At the end of January, a court charged him in absentia with illegal actions to bankrupt a bank affiliated with Prime Minister Bidzina Ivanishvili. The court sentenced him to pretrial detention. “If I were on Adeishvili’s place, I wouldn’t leave the country,” Saakashvili said during a talk show on Channel 1 Friday. Despite this, he thinks that Adeishvili doesn’t deserve those things the current government is subjecting him to. “He didn’t have any bank accounts anywhere. I know well that he doesn’t have any kind of income, where he left, but it is no problem for him to find a job, because he has high qualification,” Saakashvili explained, adding that Adeishvili had planned to leave the country after the parliamentary election. He told the president about it.